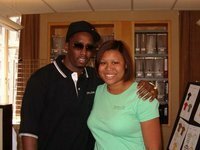 I interned with P. Diddy’s design team in Manhattan, NY during the summer of 2006. There was a denim team that researched and designed his icon jeans. There was a graphics team that researched and came up with different t-shirt graphics. There was a woven team that researched and designed different collar shirt. There was also a trim team that came up with different ideas about buttons, labels, and accessories. Overall it was a wonderful experience that I will never forget. The teams were down to earth and very helpful. Being able to work with a real design company showed me the ins and out of running a company. I also enjoyed living the big city life!